In 1939, a group of expelled members of the Church (Reymundo Mansilungan, Cirilo Gonzales, and Teodoro Briones) conspired to discredit Brother Felix Y. Manalo. The three convinced Rosita Trillanes, another expelled member, to sign a “letter” claiming that Brother Manalo raped her and other women. 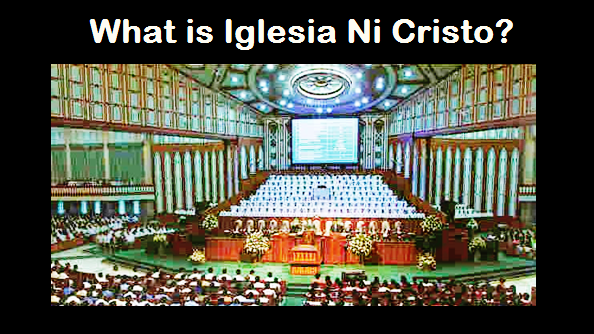 The three promised Rosita that they willl only show the “letter” to members of the Iglesia Ni Cristo. But, when no one believe them, knowing that they were expelled members only attempting to take vengeance against Brother Manalo for expelling them from the Church, they published the letter in a local newspaper in Pampanga. Thus, Brother Felix Y. Manalo filed a libel case against Mansilungan, Gonzales, Briones, Trillanes and the editor-in-chied of the newspapaer wher the “letter” was published. Take note of what the “decision” said, “a certain Liloy,” “a certain Basilia,” “a certain Protacio.” This only means that these people did not appear in the court. Thus, they accepted only the words of the accused without asking to show evidences. These words stating “a certain Liloy,” “a certain Basilia,” “a wife called Amada,” “a certain Protacio,” only prove that these people were not presented as witnesses for Rosita because these people certainly did not appeared in the court. Actually, the decision itself shows that Rosita had only one witness. The said decision of the Court of Appeals said, "HER WITNESS" (take note that it's singular, "her witness"). Pioneer ministers and brethren mentioned that Rosita’s witness was “Reymundo Mansilungan” himself (the “mastermind” of the conspiracy against Brother Felix Y. Manalo). Also noticeable is that the defendant (Rosita) mentioned "other victims" (that Brother Manalo had other victims beside her) but she failed to produced or named the "other victims." It is very surprising that the said Court immediately accepted as true the words of Rosita that Brother Manalo “raped many women” without naming to the court those "other victims." It is like saying “he killed many people” but failed to produce the victims’ bodies or even the “names” of the so-called victims. Accepting as “true” the statement without concrete evidences, you call that “justice”? Certainly, if a person will say to the court that “a person raped many women,” the court will surely ask the names of those “women.” If the person will answer, “I don’t know the names because I only heard that to a certain Reymundo,” surely the Court will dismiss that statement as “rumor” and not as fact. Thus, this decision was based on mere statement of Rosita Trillanes and her lone witness (Reymundo Mansilungan), no other evidences showed, no other witnesses appeared, no other victims emerged. Take note that this was in the time when the Philippines was under the Japanese imperial army, that Brother Manalo had conflict with the Japanese authorities and was arrested several times by the Japanese (and even ordered by the Japanese army to step down as Executive Minister of the Church), and the Church Of Christ then was a small, poor Church, with no resources and influence. Thus, it cannot be said that no other witnesses or victims emerged because they were afraid of Brother Manalo and the Church Of Christ. From the justices, to the prosecutor and up to the Solicitor General, they all believe “…that the offended, Manalo, committed immoral acts with some women, members of his church.” Take note that Rosita Trillanes and company were the accused, thus, the prosecutors and the Solicitor General supposed to prosecute her and not Brother Felix Y. Manalo (the complainant). However, in this case, it seems that the complainant was the one being prosecuted and the accused was the “witness.” WHAT A JUDICIAL PROCEEDING! 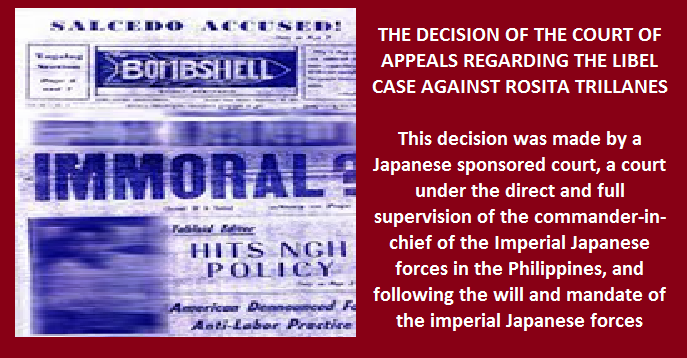 REMEMBER THAT THIS HAPPENED DURING THE JAPANESE OCCUPATION PERIOD AND THAT THE SAID COURT WAS A JAPANESE SPONSORED COURT. (7) that this “decision” (published in Philippine Gazzete on July, 1942) had no effect on the progress and growth of the Iglesia Ni Cristo proving that the people then did not believe this questionable “decision” made by a Japanese sponsored court. Failure in refuting these arguments is failure in establishing the "credibility" of the said "decision" of the Japanese sponsored Court of Appeals regarding the Rosita Trillanes' libel case. NOTE: After a decade, Rosita Trillanes and her family went back to the fold. They asked forgiveness from Brother Felix Y. Manalo, and they were forgiven. Rosita then made an affidavit retracting the controversial “letter” she signed in 1939.